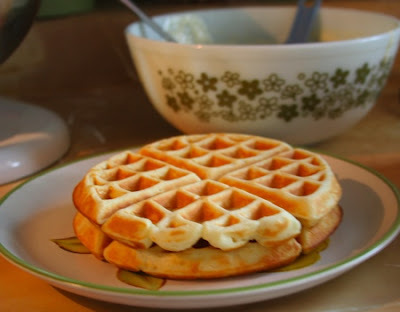 I've tried other recipes for waffles, but this is always the one I return to. They come together quickly and the sour cream makes their texture just about perfect. 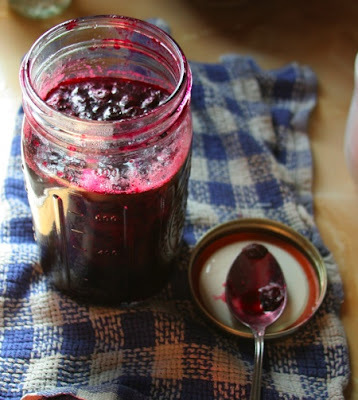 Especially with some fresh blueberry syrup. In a medium sized bowl, combine flour, sugar, baking soda, baking powder and salt. In another small-medium sized bowl, whisk the eggs, sour cream, milk and vegetable oil together. Make a well in the center of the flour mixture, pour in the wet mixture. Stir until just combined. Preheat the waffle iron. Fill and bake according to the manufacturer's directions. In a medium saucepan heat the water and sugar until the sugar is dissolved. Add the blueberries and bring to a boil. Lower to a simmer and wait for the blueberries to soften. Gently mash the blueberries while the blueberries are still in the saucepan. Serve over waffles, pancakes and french toast. A little whip topping is a nice touch too.